We are very pleased and grateful to announce the recent donation of a spectacular 1916 Pierce-Arrow donated by 40 year Pierce-Arrow Society member Conrad Fletcher. 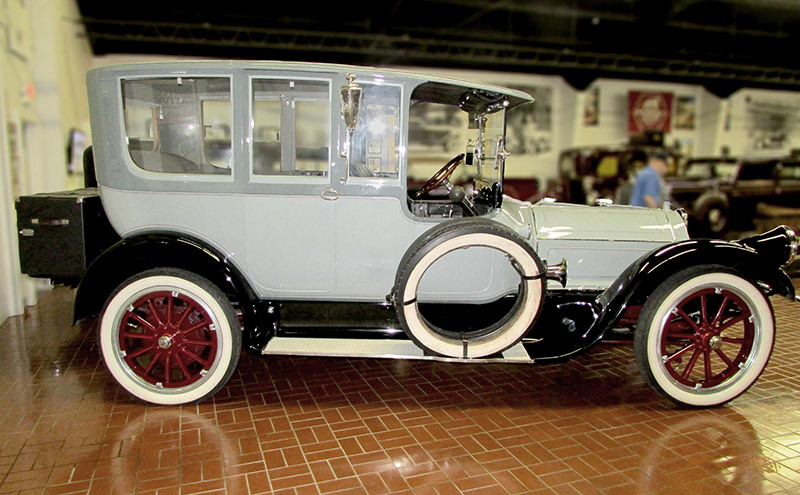 This 38-C-4 Series open front Limousine is in immaculate condition and has long been a reliable tour car for Mr. Fletcher. Our Executive Director first saw and admired this car on a Horseless Carriage Club tour years ago. To see it now in the Museum Collection following Conrad’s very generous donation was an especially humbling experience for him. The car will receive a prominent placement in our display and is sure to impress visitors. This very generous donation fills a much needed gap in our collection. It has been listed in the Society roster as a 1915 due to a December 1915 production date, but the correct model year for the Series is 1916. It is my understanding that this Limo was a part of the Bill Harrah collection. Mr. Fletcher also donated another non-Pierce vehicle to the Foundation that will be loaned as a “Study Display” on the Gilmore Car Museum campus for the time being. Thank you, thank you Con for your generosity in support of the Pierce-Arrow Museum and Foundation!